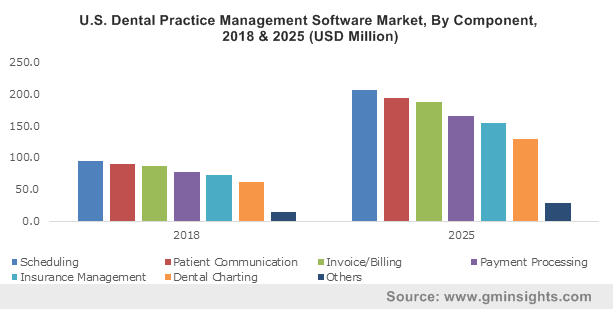 Dental Practice Management Software Market size was valued over USD 1.1 billion in 2017 and is expected to witness 11.6% CAGR from 2018 to 2024. Increasing geriatric population worldwide will act as high impact rendering driver for dental practice management software (DPMS) market growth. As per World Population Prospects data, the aging patient base aged 60 years and above is predicted to be more than double by 2050. Rising number of elderly patient pool suffering from dental disorders will result in industry expansion. Growing awareness and increasing focus on oral health in developed economies will augment demand for dental practice management solutions in future. Various initiatives and awareness programs conducted by several organizations have contributed to create high awareness to cater the ever-increasing need for quality dental care. Increasing burden of dental diseases globally, leads to rise in healthcare expenditures. Rising need for implementation of cost containment measures to curtail escalating healthcare costs will boost adoption of dental practice management solutions by the dentists in the coming few years. Rising technological advancements along with increasing adoption in the developed regions will drive industry growth over the forecast timeframe. Rapid innovations in the field of dentistry including transformation of stand-alone practice management softwares to integrated EHR/practice management solutions and advanced modules will spur demand. Increasing venture capital funding and favourable government support is further set to propel the market growth. However, dearth of skilled IT professional required for providing service and support to the dental practice management software vendors may limit the market growth to a certain extent. 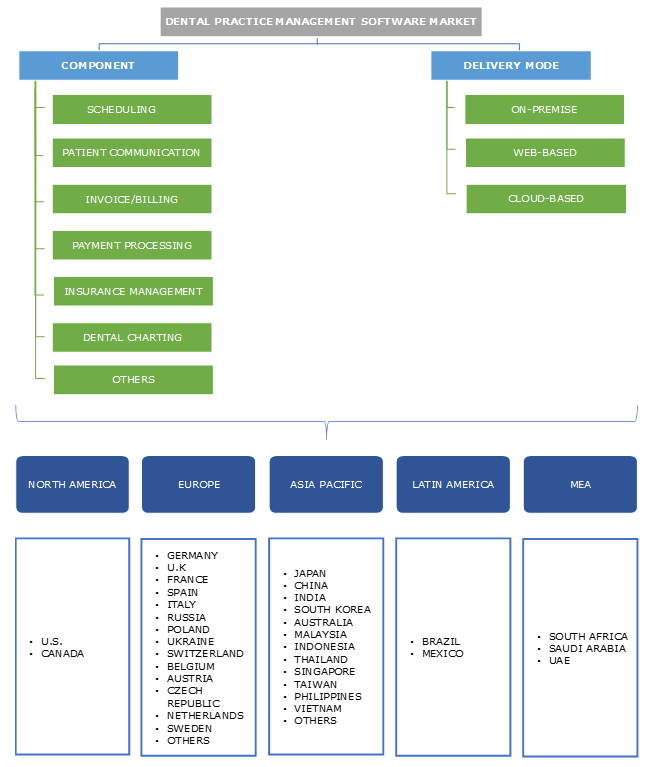 Scheduling business segment dominated the global DPMS market with around 19% of revenue share in 2017. Growing awareness regarding oral health among geriatric population has resulted in increasing number of dental check-ups. Effective scheduling of these patients through software will enhance productivity and reduce inconsistency for the dental practitioners, thereby augment segmental growth. Patient communication segment will witness significant 11.7% CAGR over the forecast period owing to increasing usage of dental practice management software for connecting with patients and automating tasks such as appointment confirmations, recall reminders. Web-based software business segment valued at USD 472.0 million in 2017. This is attributable to increased flexibility and convenience offered by such solutions leading to effective clinical data management and reduced costs. Also, web-based dashboard permits operators to assess main metrics as well as track day-to-day schedules, thereby boosting segmental market growth. Cloud-based business segment is forecasted to grow at robust 14.6% CAGR over the projection period. Increasing adoption of cloud-based solutions to cater the growing trend of patient-centricity will drive segmental growth. Cloud based software enables data availability to multiple locations and allows to achieve patient satisfaction as well as improved clinical outcomes, thereby fuelling its demand over the coming years. U.S. dominated the dental practice management software industry with a market size of USD 450.7 million in 2017 and will witness similar trend over the coming years. Favourable demographic trends such as rising elderly patient pool suffering from oral diseases will act as high growth rendering factor. Rapid expansion in healthcare IT owing to favourable Health Information Technology for Economic and Clinical Health Act (HITECH Act) will drive market growth. Such factors will enable U.S. to maintain its dominant position in the industry. Germany accounted for more than 28.0% market share in 2017. Increasing prevalence of dental disorders along with growing focus on oral health by geriatric population will drive industry growth. Presence of German Dental Association responsible to increase awareness for oral hygiene will further propel market growth over the coming years. Indian DPMS market is poised to witness considerable growth due to rising geriatric population suffering from oral problems, growing healthcare awareness and favourable government policies. For instance, development of software management system by Indian Dental Association (IDA) for uniform online registration of dental personnel will augment market growth. Some of the major players operating in global market include Henry Schein, Carestream Dental, Patterson Dental, Curve Dental, Quality Systems. Other industry participants include Dovetail Dental Software, Epic Systems Corporation, Allscripts Healthcare Solutions and DentiMax among others. Acquisitions, new product launch and distribution are the major strategies adopted by the industry participants to increase their foothold in the market. Rapid innovations in the field of dentistry will drive dental practice management software market. The industry is witnessing shift towards digitization thereby boosting demand for dental practice management software. Rising adoption of technological advanced cloud-based solutions in the developed regions enabling better service at affordable cost will foster industry growth in the future. Increasing pressure of cost containment along with rising awareness pertaining to oral health among the expanding elderly patient pool in the developing countries will augment the global market growth.